Our trails face north, so the map shown above is oriented with south at the top. 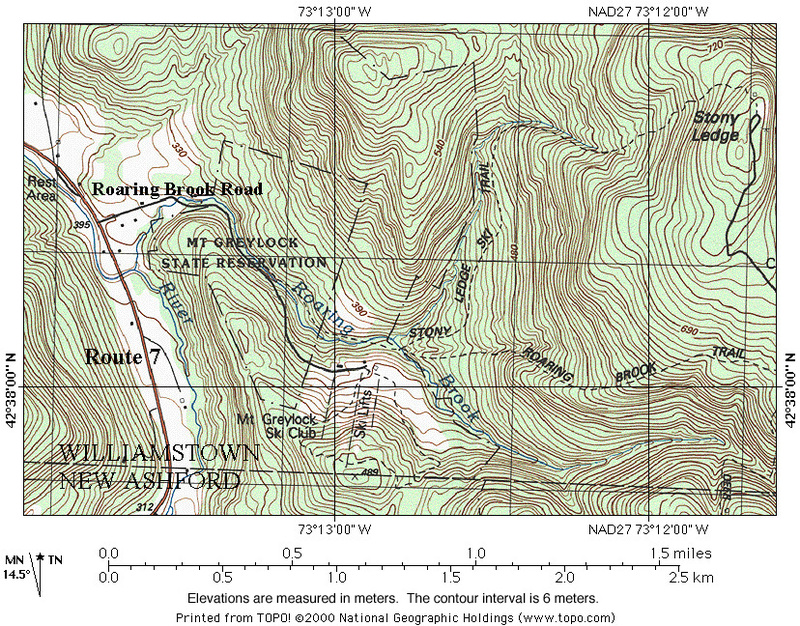 For a topographical map showing the Mount Greylock Ski Club and the Stoney Ledge Ski Trail, please click here. Depending on where you measure, our ski area has an elevation difference between 300 and 350 feet. Rope Tow 1 is 1,300 feet long and the ride to the top takes 72 seconds. That works out to 18 feet per second, which is as fast as many high speed chairlifts. We claim that Tow 1 is the longest and fastest rope tow in New England! Rope Tow 3 is 600 feet long and moves at a more leasurely speed. It serves our beginner terrain. The Massachusetts Recreational Tramway Board has granted ski club members permission to use Bousquet tow grippers on our rope tows. We also recommend wearing sturdy work gloves because Tow 1 will wear out most ski gloves quickly.